The holiday season of Holy Week and Easter will bring to Cancun about half a million tourists, of which 90% would be national, according to the projections of hoteliers and authorities of the sector. According to the Directorate of Municipal Tourism, the report of the hotels of this tourist destination says that there will be an occupancy higher than 80% for this season that will run from April 7 to 21. Tourists from Mérida, Campeche, Tabasco, Veracruz, Chiapas and even Mexico City will drive to Cancun. Municipal authorities say that the projections for this holiday season are positive. 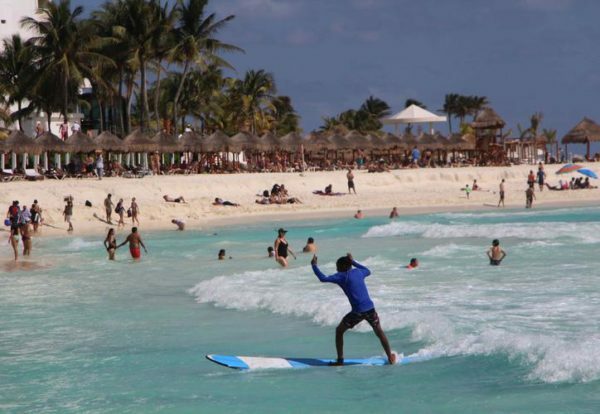 And added that during the winter travelers from Canada and the United States came to Cancun in large numbers. Roberto Cintrón Gómez, president of the Hotel Association of Cancun and Puerto Morelos (AHCP), mentioned that these two weeks thousands of national families will be visiting Cancun for Semana Santa and Semana de Pascua. “We already have reservation for 65% occupation, but the purpose is to reach 93%, however, that the national visitor usually confirms their stay at the last minute,” he added. Holy Week represents a breath of fresh air for tourism companies, although after those two weeks, occupancy is expected to fall by up to 10%. “For Isla Mujeres, the projection is 25 thousand visitors per day, an increase compared to the current figures of 18 thousand tourists per day last year”, said Juan Carrillo Soberanis, municipal president of the island. The issue of sargassum could affect tourism, however, hoteliers and authorities are taking the necessary measures to deal with the algae that reaches the coasts in large quantities. Domestic tourism registered significant growth, and according to Aeropuertos del Sureste, in the fourth quarter of 2018, domestic traffic was 2.2 million visitors, that is, 14.4% more than in the same period in the previous year. Cancun is on my list, I hope that will be fun this year.